22 CEMENT AMERICAS • Spring 2018 • www.cementamericas.com FEATURE evant cement phases, such as residual cement grains (alite, belite and ferrite), hydration or reaction rims, calcium silicate hydrate (C-S-H), ettringite and calcium hydroxide, as well as an indication of the cement paste porosity distribution. Figure 3 shows the QXRD phase quantification of the pastes prepared with Cements 1 and 9 at 24 hours of hydration. The error bars represent the standard deviations of pastes prepared from these cements on two different days. 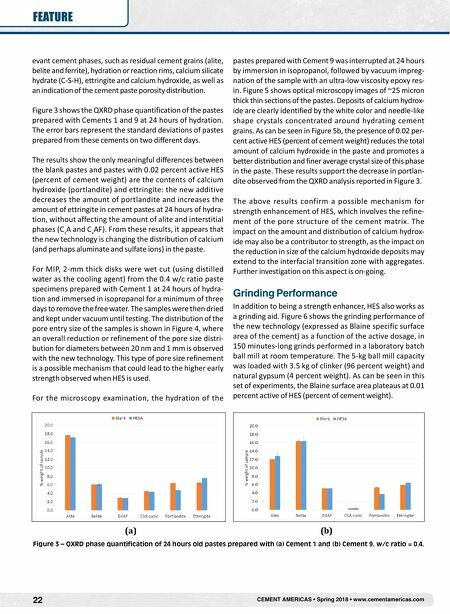 The results show the only meaningful differences between the blank pastes and pastes with 0.02 percent active HES (percent of cement weight) are the contents of calcium hydroxide (portlandite) and ettringite: the new additive decreases the amount of portlandite and increases the amount of ettringite in cement pastes at 24 hours of hydra- tion, without affecting the amount of alite and interstitial phases (C 3 A and C 4 AF). From these results, it appears that the new technology is changing the distribution of calcium (and perhaps aluminate and sulfate ions) in the paste. For MIP, 2-mm thick disks were wet cut (using distilled water as the cooling agent) from the 0.4 w/c ratio paste specimens prepared with Cement 1 at 24 hours of hydra- tion and immersed in isopropanol for a minimum of three days to remove the free water. The samples were then dried and kept under vacuum until testing. The distribution of the pore entry size of the samples is shown in Figure 4, where an overall reduction or refinement of the pore size distri- bution for diameters between 20 nm and 1 mm is observed with the new technology. This type of pore size refinement is a possible mechanism that could lead to the higher early strength observed when HES is used. For the microscopy examination, the hydration of the pastes prepared with Cement 9 was interrupted at 24 hours by immersion in isopropanol, followed by vacuum impreg- nation of the sample with an ultra-low viscosity epoxy res- in. Figure 5 shows optical microscopy images of ~25 micron thick thin sections of the pastes. Deposits of calcium hydrox- ide are clearly identified by the white color and needle-like shape crystals concentrated around hydrating cement grains. 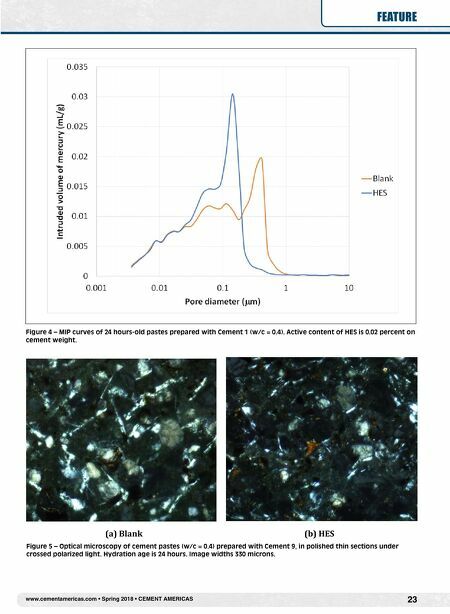 As can be seen in Figure 5b, the presence of 0.02 per- cent active HES (percent of cement weight) reduces the total amount of calcium hydroxide in the paste and promotes a better distribution and finer average crystal size of this phase in the paste. These results support the decrease in portlan- dite observed from the QXRD analysis reported in Figure 3. The above results confirm a possible mechanism for strength enhancement of HES, which involves the refine- ment of the pore structure of the cement matrix. The impact on the amount and distribution of calcium hydrox- ide may also be a contributor to strength, as the impact on the reduction in size of the calcium hydroxide deposits may extend to the interfacial transition zone with aggregates. Further investigation on this aspect is on-going. Grinding Performance In addition to being a strength enhancer, HES also works as a grinding aid. Figure 6 shows the grinding performance of the new technology (expressed as Blaine specific surface area of the cement) as a function of the active dosage, in 150 minutes-long grinds performed in a laboratory batch ball mill at room temperature. The 5-kg ball mill capacity was loaded with 3.5 kg of clinker (96 percent weight) and natural gypsum (4 percent weight). As can be seen in this set of experiments, the Blaine surface area plateaus at 0.01 percent active of HES (percent of cement weight). (a) (b) Figure 3 – QXRD phase quantification of 24 hours old pastes prepared with (a) Cement 1 and (b) Cement 9. w/c ratio = 0.4.